In order to determine the carat of your gold, and find out the right price of gold per gram, you will need to look at the hallmark. A hallmark means that an item has been individually tested by an Assay Office and guarantees that it conforms to a specified legal standard of purity. 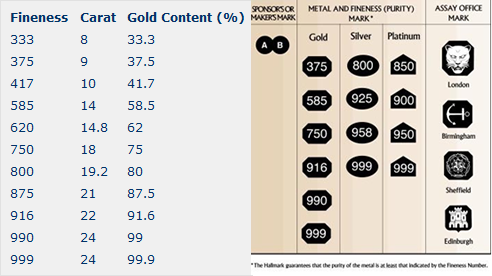 Please see the table below for visual examples of gold hallmarks. Please do not worry if you are unable to determine the carat of your gold, Best Price For Gold will be able to ascertain the carat for you.